There is nothing quite like building your own space, whether it be a shed, studio, home, or commercial building. The satisfaction and joy of looking at the progress you have made at the end of each day is literally priceless! With load bearing construction, the step from beginner to successful builder is smaller than in framed structures where a lot of carpentry skills are required. That one small step may be all it takes to bring out your inner builder that loves to create! 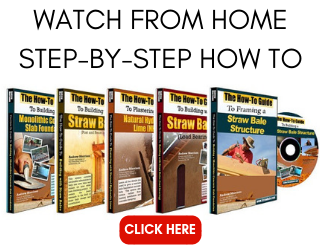 There are two general styles of straw bale construction: Post and Beam (or In-Fill) and Load Bearing. Post and beam construction is where a structural frame is built and the bales are then placed into that frame as insulation. The bales have no structural value for the loads of the building which are all carried by the structural frame. In general, the frame is either wood or steel. Load bearing construction is where the bales are used as the structure for the building and they bear the load of the roof assembly. Under certain circumstances, they are the most cost effective and simplest way to build. The most obvious reason to choose a load bearing structure is the simplicity of the construction. If you have ever built with Legos, you have the understanding to build a load bearing structure. 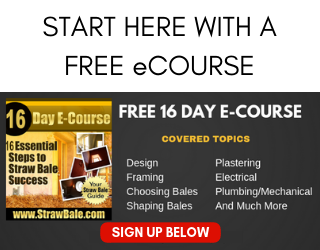 The principles are the same: stack the bales properly so that they cannot separate easily and make sure to interlock the corners from one direction to another. This helps stabilize the entire structure. Again, imagine what a Lego house would be like if you built four separate walls without interlocking them. Keep things straight and plumb. This is true in any type of construction, and proves very important in load bearing structures as the bales themselves are the load supporting structure. 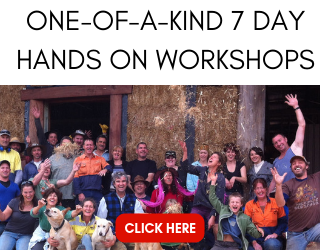 With some basic common sense and construction skills, a group of people can work together and build a load bearing straw bale house. The amount of fun that takes place is totally up to you, but in general, much of it is to be found on a bale raising site! Another common reason to build a load bearing structure is to reduce the amount of wood or steel in a home. A load bearing home uses the bales to support the roof assembly and so very little wood is required. Wood is still needed to add windows and doors to the building and to frame the roof and the actual box it attaches to on top of the bales; however, significant amounts of wood can be eliminated from the construction of a building with load bearing techniques. I always suggest that people make an attempt to build a small structure before they take on a project like a home, winery, or other commercial space. Building a large structure is difficult and labor intensive. Practicing on something small is a great idea, especially if you intend to build your own place. Even if you plan to hire out the work, I suggest taking a hands-on challenge and building a small structure yourself so you are familiar with the building process. There are some disadvantages to load bearing construction, mostly related to design restrictions such as building height and amount of window openings to comply with code restrictions. However, I have seen large single-level/ranch style residences that have been built with load bearing techniques. If you have been feeling reluctant to actually roll up your sleeves and begin building with straw bales with a post and beam building because of “performance anxiety”, I strongly encourage you to begin with a small load bearing structure.